The grapes were sourced from selected vineyards throughout the southern part of the valley, and the blend is composed of 96% Cabernet Sauvignon and 4% Petit Verdot. We produced 200 cases of that vintage. The name TELA is Latin and means Canvas or Painting (“Toile” in French). 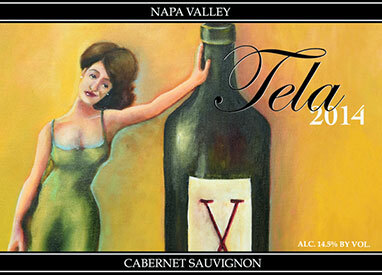 The painting featured on the front label was created by Napa Valley artist Annie Bouthillette Mercier. It is entitled “No glass needed”. Each of our vintages illustrate a different painting from Annie, featuring enjoyable wine drinking moments. The originals are on loan at the renowned Vintners Collective of Napa, where TELA wines are made available to you. We hope that you will cherish this collection over many years to come.